Risa asked me to make dinner tonight. I've wanted to make Pizza for a long time, so I did some scouting on the web (found a few good looking pizza recipes but none of them were for convection ovens) so in the end I checked the Japanese cookbook that came with my convection oven. It has a recipe so I used that. First off, the dough from scratch. I didn't know there was both strong and weak flour, so I had to get some of the strong kind. Making the dough was pretty fun; it was the first time I used yeast and watched the stuff rise. Pretty impressive. I had to make a lot of use of a metric conversion chart and a lot of guessing, but in the end the dough turned out pretty good. I also used this recipe for tomato sauce which turned out pretty good. At the same time, since I felt a bit bad about always making American food for Risa, I wanted to try something with fish. 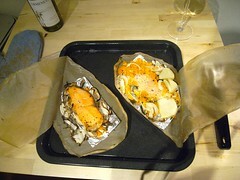 I decided to try a salmon fillet en Papillote because it sounded like fun, and my convection oven cookbook had a recipe also. My book didn't have good directions on how to do the heart-shaped cooking bags, so I checked this page, but in the end my paper bags were too small. It turns out we were not hungry after the first pizza, so I just put those in the fridge and I'll try to salvage them tomorrow. The pizza went well. I made the dough, let it rise in the oven (which has a setting for it,) let it rest, and then put on the ingredients and we were off to the races. I did more chopping on this night than I ever had before. 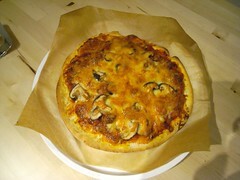 The sauce turned out great, and on the pizza I had mushrooms, some sausage, and cheese. It was great. 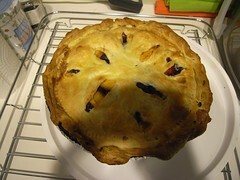 The recipe actually made two pies, so one of them went into the fridge. 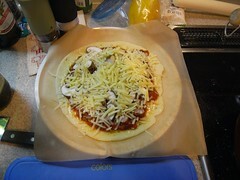 I'm really happy with the experiment though; I foresee more pizza in my future. 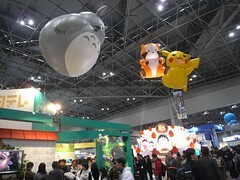 Last weeked, R. and I had tickets to go to the Tokyo International Anime Fair. Why did we have tickets to go? That's a good question. It turns out that the President of Mushi Productions is a relative of Risa's father, and he passed on two tickets to the show. So we decided to go. We didn't have too much time there, but it was interesting. I would like to go back when I have more time. 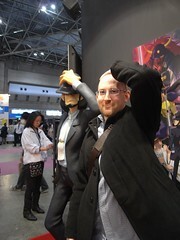 We checked out a few of the studios, I was interested in the China productions booth. They had a large booth, but not too many visitors. The big anime players were very popular, but I don't really know too much about anime, so it I didn't really know what was what. Risa and I had an appointment later in the afternoon so we didn't hang around for too long. There were lots of foreigners there. They seemed to be pretty into anime. Maybe I won't go next year. Maybe I will. Hard to say. 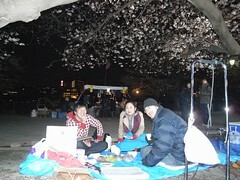 After the anime fair, we headed out to Ueno park for a hanami party with our friends. 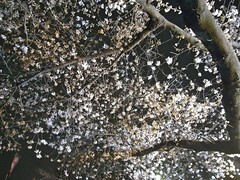 Not much of a party really, only the four of us, but it is the time for cherry blossoms. Unfortunately, it is unseasonably cold. I was freezing. There were plenty of people out at Ueno park though, never let it be said that the Japanese are put off by a bit of cold. The party next to us actually seemed to be workers from construction, because they had industrial strength lighting (which the park cops had them turn off three times,) three generators, electric grills, all sorts of stuff. 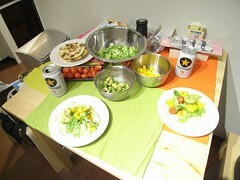 Mibe and his girlfriend cooked up some great food, and there was plenty of drink to go around. That didn't stave off the cold though. Anyway, I'm glad that Risa and I got out for a hanami at least once this year - right now the cherries are at full bloom, and I doubt we'll get out again even though it warmed up. I might go for a walk tomorrow in the nearby park though. That might be fun. I'll probably just clean though. 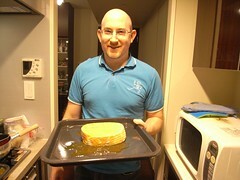 Last night I cooked dinner. I've decided to try to come home a bit earlier and cook at least once a week. And also run. But that is a different post. Anyway, I've wanted to make tacos for a while, so that is what I did last night. The big deal for me was making tortillas from scratch. I found a recipe online and went for it. I did burn the tortillas, and they were a bit small (I cut the portions in half and still had leftovers) and a bit stiff, but edible. And good. And kind of fun to make. I also got an avocado, cut that up, a yellow pepper (need some color), a head of lettuce, hamburger, and mixed seafood. Also some great jalepeno cheese. I made a bunch of cheesy mixed seafood, which was great, and standard hamburger meat for the taco (also great - but could have used some cheese) and away we went. I think we both ate a bit much, but it was fun, and R. was suprised that Taco night didn't involve octopus. Tonight I decided to go for broke and I cooked up some chicken cordon bleu. 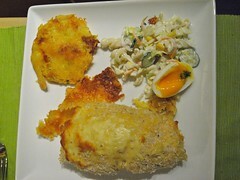 I have always liked the idea: ham and cheese wrapped up in chicken with breading and cheese. I can't really find a problem with that. It sounds delicious. So I went shopping and armed myself with a random recipe from the net (that is where I get most of recipes - the "I'm feeling lucky" button) and came home. I was a bit late because work went late (and I have to log on again in a minute) so dinner ended up being pretty late too. I also don't have a meat mallet - I used to have one back in New York, but I don't now. I figured I didn't need one though because I have Eric's old sugar jar which is glass and fairly heavy. So I used that to pound on the chicken breasts for a while. I didn't ever manage to get them very flat though. Too bad, because that was the main flaw. Anyway, I pounded the chicken semi-flat, added in some cheese and ham, and rolled them up, battered them, and cooked 'em. I had some stuff left over (flour, egg stuff, bread flakes, ham) so I mixed all that together and made some sort of crazy fake latkes. A final thought: this stuff is like, entirely meat! It is amazing! 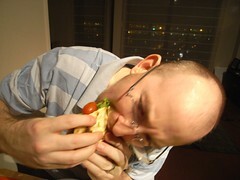 I was shocked after I ate it that ... this is American Food! 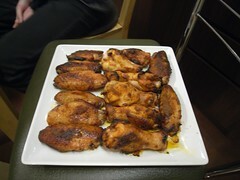 We actually only ate half of one of the chicken breast things because it was just so much meat. Along with the salad and random fried ham stuff I made, just wow. Meat meat meat. 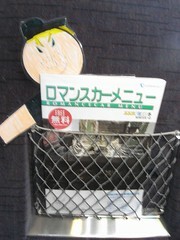 The other day I bought the book 日本人の知らない日本語, "Japanese that Japanese people don't know". It is a cute little book with comics, lots and lots and lots of ruby (furigana readings over the Kanji) written by a Japanese language teacher who primarily teaches foreign students. The idea is that foreigners have lots of crazy questions about the Japanese language that Japanese people just don't think about. Having asked lots of those questions myself, I thought it would be a fun read. So far, it has. There is lots of ruby over the kanji, so it is very easy to read. Unfortunately, the vocabulary is pretty large, and by nature heads off into unusual places in the language (like counters for strange things, or the names of unusual utensils) so it isn't really appropriate for entry level Japanese language learners. That said, so far it hasn't really been all that hard to follow, so if you are an intermediate learner you might want to give it a try. Actually, I take that back. Some things are hard to follow. The punchlines usually. The things that students say make intuitive sense to me - because I don't understand the natural Japanese language things that the readers are supposed to know. Sometimes the last panel of the comic just leaves me scratching my head. The sequel just came out recently so I'll probably pick that up pretty soon too. I've been doing some Cocoa Programming for Mac OSX lately. I've been using Aaron Hillegass' "Cocoa Programming For Mac OSX" and have really had an easy time following along with the book. Before ordering the book, I tried to dive into OSX programming using online material, and while I was able to get some things done, I was having a real hard time trying to wrap my head around general concepts (how does the general cocoa interaction model work? how do I try to understand when to hook things up with connections in interface builder and when to code things? What things are done for me automatically?) and found that this book has been good at explaining these things. The book itself is pretty easy to follow and has extensive screenshots, not normally something that I would think is important in a programming book, but for XCode and Interface Builder this is surprisingly helpful. Oh, I have to drag from this to that, or that is the pane in the inspector I need to be looking at. A surprsingly large amount of "programming" so far has involved knowing what key to type in which box in interface builder to get some control to watch some value in some object. And knowing which objects that Apple already provides has keys that can be watched to do what you want. I'm coding on snow leopard (10.6) and the book was written for 10.5 so there are some disconnects there, but so far I haven't run into any errors with the code that I can't figure out quickly. The biggest so far has been an example in Chapter 11 which looks like it is a bit hairy to fix. The amount of commitment I need to make as a student to something that is easy (binding in Interface Builder) compared to writing a (granted, very small!) custom class and using it to basically just type cast is pretty big. It seems like a simple type cast operation could also be accommodated in the bindings / core data paradigm (and it is, using transformations, and a small custom class) but at any rate I have really been enjoying this book. It makes it much easier to get a handle on where to start, and since I have programming experience (C / C++, Java user interfaces, and perl mostly) I have been able to get through about a chapter per session while doing the examples and challenges. One of the controversial things seems to have been the introduction of "dot notation" in Objective-C 2.0. This post on Big Nerd Ranch explains pretty well how I feel about it. It is confusing to me. I like the @property and @synthesize tags added to the language a lot; being able to use dot notation sounds convenient, but only if the class is accessing properties. Otherwise it can be confusing. Is that a method call? Is it doing anything tricky with memory? Do I have to worry about it and check the setter / getter selector? I'm going to stick with bracketed notation until I get a better handle on these things. I also like that Objective-C 2.0 introduced garbage collection, but I also want to do explicit memory management with release / retain for a while. I've been really impressed with how easy it is to create user interfaces in XCode / Interface Builder. All I have to compare with is Java's Swing platform, and I never used any GUI interface builders with that. I know things are getting better in that area with NetBean's Matisse and some of the Eclipse plugins, but every time I have looked at those they don't seem to save you from writing much of the boilerplate code that you need to navigate user interfaces. With XCode and Interface Builder you really don't have to write much code and things are saved out as data. Coverage from Columbia University's "The Record"
Computer Science Professor Shree Nayar at Columbia University has a pretty cool project in the BigShot Camera. It is a digital camera designed to teach kids about optics and electricity and all sorts of other things. I think it looks really fun. They include a power generation explanation that is exemplified by a hand crank that you can use to charge the camera up. It also has three different lenses that you can use to change the types of images the camera takes. I think this is a really fun way to introduce kids (even high school students and college students…) science. Too bad they aren't available for sale. They would make absolutely great toys. I should also note that Professor Nayar is a really great guy; when I was a grad student in Computer Science at Columbia University I had really good interaction and experiences with the faculty there. So I'm probably biased (don't bloggers have to disclose their biases now?) and just wanted to write something up quickly when I saw this project in the recent Columbia Magazine that I received. It also had a cool piece about the new Northwest Science Building that I really wish was around when I was there! (This post is very late, please forgive the tardiness.) 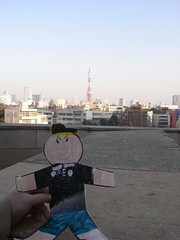 In my previous post about Flat Everett we met our flat friend, and took him around Tokyo. Over the New Year's break we took two more trips with him. First off, Japan doesn't have a big Christmas break, but they do have a big break over the New Year's holiday. Usually people get the 30th and 31st off, with a few days around the New Year, going back to work around the 4th. Over the break my wife's sister and her daughter came to stay with their parents, who live just down the street from us. 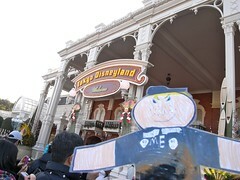 One of the big events was a family trip to Tokyo Disneyland. We all piled into the car the morning of the 31st, and headed out to Chiba, about an hour away or so by car. The place was very crowded. Since the day before there were people waiting (out in the cold!) for the 6pm start of the Disneyland New Year's celebration. We weren't going to stay for the evening celebration - you have to win a lottery drawing to be invited for that - so just headed in. I got a picture or two of Everett in front of the Disneyland entrance, and some of the 2010 New Year's signs, but didn't get too many other pictures of him. He was enjoying the rides from inside my bag. The most exciting ride we went on was Space Mountain. I'm sure Flat Everett enjoyed it, but I have never liked roller coasters, and had to go to the Nurse's Station (where R. works actually) and rest for two hours. Then I went home while everyone else stayed at the park. The other thing that people in Japan do after the new year is go visit a local temple. The "first temple visit" of the year is traditional, and people buy various charms for good luck for the new year. 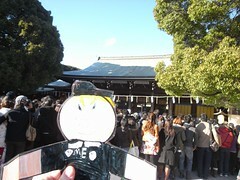 I decided to take Flat Everett to one of the most popular temples in Tokyo, Meiji Temple. The temple is very popular, and when I went on the second (I think) Flat Everett and I had to wait about three hours total in order to get into the temple itself. The place was absolutely packed. 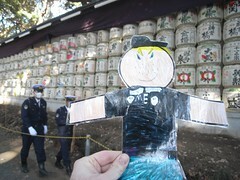 I got a few pictures with Flat Everett, one in front of the temple archway (the wooden gate structure, called a Torii), and also in front of a collection of sake barrels that are donated to the temple by local businesses. 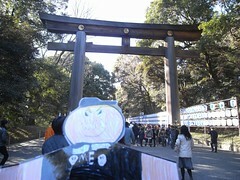 The final picture is Flat Everett in front of the main temple structure. 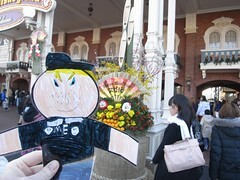 That concludes my travels with Flat Everett. He has since moved on, and arrived in New York. I'm curious to see what sort of trouble he gets into in my old stomping grounds, New York City. Review of Lawrence Watt-Evans' "The Unwilling Warlord"
So a few days ago I finished reading the second book in the Ethshar series by Lawrence Watt-Evans. It took a bit of time for it to get going, but I liked it in the end. The third book, The Unwilling Warlord, was quicker to get started. What I have really enjoyed about the Ethshar series so far is that the protagonists are more or less normal people. They don't want to save the world and generally just want to do what they can to lead a comfortable life. The second book in the series was a bit tougher to get into because I didn't like the (lack of) work ethic in the protagonist. I didn't have that problem with the protagonist of the third book. He seemed like a bit of an opportunist, but not lazy and not stupid. He takes a fairly straightforward approach to things, and the story one of the magic systems in Ethshar (Wizardry) in depth. I really like the multiple forms of magic in Ethshar and am looking forward to seeing more stories in the world that explore more of the magic system. This entry in the series focuses on a gambler playing dice for small stakes, who finds out that he is the hereditary warlord for one of the small Southern Kingdoms. He's forced into service there and of course hijinx ensue when the small kingdom faces a war on two fronts. He falls back on his gambler instincts and decides to use magic to cheat. That's basically the summary from the back cover, so I'm not giving anything away. I would really like to see a story set in this area a few years down the road to see what came of Sterren's story. I enjoyed the book quite a bit. I wonder how it has been that I didn't find Lawrence Watt-Evans' work before. I know it can't be because of the name; he's got a great name. He apparently has another well-known fantasy series The Lords of Dus. And a few others it looks like. I've really enjoyed Ethshar though because they are a bit light-hearted and fun. 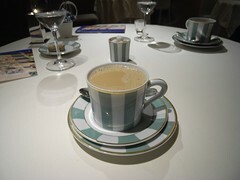 Last night R. and I invited our friends A. and D. over for dinner. 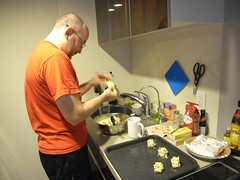 R. was working, and I had the day off so I spent the morning and afternoon in the kitchen cooking up dinner. A few weeks back we had some friends over for a Christmas dinner and that went pretty well, so I wanted to try it again. I scaled back the menu a bit, but still it took a lot longer to cook everything up than I expected. I'm a pretty poor cook, so that probably explains it. Anyway, what was on the menu? Honey Glazed Ham. 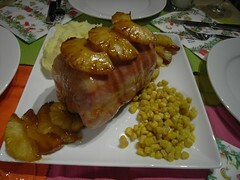 I liked the ham I made last time, and wanted to try a larger-scale version of it. The problem: when I finally went shopping for hams, I couldn't find one as large as what I would expect to find in the US. The ham I did get, a Rosenheim 750g gift ham was about a third of the size that I would expect of a US ham, and more expensive to boot. Ah well. Mashed Potatoes. Made these from scratch this time, since someone on Flickr chastised me for using frozen mashed potatoes before. It was really easy to make them from scratch (took longer though) and since I often have potatoes laying around I'll be doing this more often. Might try french fries sometime too. Corn. From a can. I love corn. Butter and Soy Sauce Sauteed mushrooms and carrots. I like butter sauteed mushrooms, so threw some carrots in there too. Pretty good! Our guests arrived and brought a bottle of champagne, so we had to try that. Actually we swapped that bottle out for one we had in the fridge, and then later moved on to beer. Dinner went well, and I think everyone had a great time. We somehow ended up on Youtube.com watching old Knight Rider and Baywatch videos. Not sure how that happened. Then The Cribs' Cheat on Me with Johnny Marr. So, dinner was great. Today I'm just relaxing (I feel like I'm coming down with a cold) so I'll take it easy, write some blog posts, and catch up on paying bills and finances, as well as some cleaning and washing I suppose. What else have I been eating lately? Well, you know I can't miss out when McDonalds Japan introduces a new burger: the Texas Burger. Looks like it is a 650 calorie burger. The picture on their site looks better than the ones I've got, but that isn't surprising. They are doing a whole series on Big American Burgers with Texas up first. It looks like it will be around for about 3 weeks before they move on to the next burger, the Big America New York Burger. Third is California, and finally they have Hawaii. (See the list with pictures here.) The Texas one looks best to me, with Hawaii coming in second. I'm not sure what the differences are on California and New York, so I guess I'll go and translate their descriptions. The wild flavor of this Texas Burger will have the wilderness of Texas floating right before your eyes! You can enjoy two different sauces, the spicy BBQ sauce and a refreshing mustard relish along with a huge quarter pound of beef (2.5 times larger than the normal beef patty.) The elasticity of the trio of carefully hand-crafted well cooked buns is the special characteristic of this burger. And you're going to love the crunchy fried onions, cheese, and accents of bacon filled with umami in this burger. This stylish New York burger will make you think of a plate from a corner cafe in New York. This burger is based on the club sandwich that is said to have originated from here. It's got a juicy quarter pound beef patty (2.5 times the size of a normal patty) with the refined harmony of Monterrey Jack cheese that was originated in America, bacon full of umami, tomatoes and lettuce. It is accented by a spicy mustard sauce. It has an unrivaled compatibility with the specially-made graham (all flour) buns. This California burger will make you feel the natural blessing of the sunshine that falls down on the state. The main point is the specialty sauce that uses white wine from California. The full quarter pound beef patty (2.5 times the size of a normal patty) is made with a mellow smell and deep flavor. You'll be fulfilled with the luxurious harmony between the tomato, lettuce, bacon with lots of umami, and Monterrey Jack cheese that was developed here. Don't forget the fragrant specialty buns topped with powdered cheese. We have locked in the world-famous beloved flavor of Hawaiian Loco Moco in this burger. A thick special gravy sauce is on the large quarter pound patty (2.5 times the size of a normal patty) with a jiggly egg, bacon full of umami, cheese, and lettuce make up this wrapped up harmony. You also can't look past the fragrant specialty buns topped with powdered cheese. Huh, sounds like they are all mostly using the same ingredients. Still, it should be interesting to see what the upcoming hamburgers are like. Lawrence Watt-Evans "With a Single Spell"
A few days ago I started reading Lawrence-Watt Evans' "With a Single Spell". At first, I didn't like it. It took a while to get into the book. I didn't like the protagonist. He was a lazy, entitled, selfish boy. I had a really hard time empathizing with him. I feel like I've worked for where I am. I was never the smartest or strongest in high school, but I was determined, and I studied hard. I didn't get great grades, but I got into the advanced classes, got some college credit, and kept that work ethic up through an (admittedly relatively unknown) undergraduate program, and went on to an ivy league school where I felt like I got a great education at the graduate level. Now I'm somehow in my mid thirties, married, own property, and live in a foreign country. I never once felt like I was doing just enough to get by, and have worked hard, and enjoy that. Anyway, yesterday, and a bit more today (on my day off) I found myself getting more and more into the story. It is a good story. I really like this world of Ethshar which seems to have a well-thought-out magic system and a plausible history and geography. I liked this book in the final acts when it really got into the wizardly magic bits of things. It reminded me of reading through the old Advanced Dungeons and Dragons Second Edition Dungeon Master's Guide with all the spells. What could you do with all those spells? How did they work? How would they fail to work? That is some really interesting stuff. I remember as a kid I would spend lots of time thinking about that, and planning out just how my moving castle would work. (I vaguely remember some sort of moving abode spell, can't recall the name now) and stuff like that. This book hits on some of those areas. So, uh, four stars? Our of ? some stars? I enjoyed it, maybe you will too! 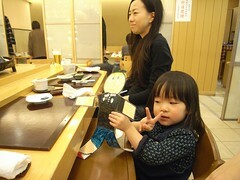 A bit before the new year, R. and I went to see the latest Pixar movie, カールじいさんの空飛ぶ家. Simply "Up" in America, and "Grandpa Carl's flying house" in Japanese. I've noticed this trend before in Japanese movie titles, where the title is more expositive than the American title. Like, for example, 2012 might be "The day the world ends: 2012" or something like that. It is a little strange, but certainly makes the general idea of the movie a bit easier to grasp. I don't see many movies in Japan: it is expensive here. There also just isn't the same culture we have in the US of heading out to the movie theater and showing up ten or fifiteen minutes before the movie starts. Every movie I've seen we have either bought our tickets online, or shown up one to three hours early to get the tickets. It is also expensive. R. and I have been seeing a few more movies recently because with her job at Tokyo Disneyland she gets an employee discount at the Disney-owned Ikspiari themed shopping mall that brings the ticket prices down to about $12 each. So we probably will be seeing more movies there. I'll try to write a little bit about them here. If you want to keep reading, be aware that there are probably spoilers for Up and Avatar. Click the read more link to keep reading. Lawrence Watt-Evans' "The Misenchanted Sword"
Note that I actually purchased the ebook from fictionwise.com. And it was cheap: about $2 when I got it, but now it is back up to $6 it looks like. Huh. I really enjoyed the book, and found it a refreshing look at a fantasy setting. I really like that the focus of the story was not on saving the world and defeating an overpowering enemy. It focuses on a character and how the character is changed by magic and war. I am always interested in books that take conventions of the genre and do different and new things with them. I'm also interested in good standard treatments though. I am not sure that I could count the number of treatments of Lord of the Rings that I've read. The story is well written and goes by quickly. The story really focuses on one character more or less but the other people you meet along the way keep things interesting also. I enjoyed the book enough that I went and bought the second book in the series. Apparently this is one of the author's less successful series, so if the second book is also good I think I'll look into tracking down some of his more popular stuff. Anyway, another book to get if you notice it somewhere! Every year, R. and I go to a nice dinner for Christmas. I really look forward to that every year. 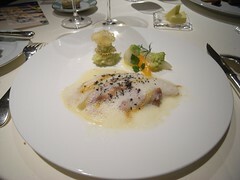 This year, I wanted to try a Michel Star rated French place in Tokyo. Well, the Tokyo part is because I live here, and the Michelin Star part is because I've never eaten at one of those places before, and I found Joseph Mallozzi’s blog, who is a producer on Stargate Universe (which I like) and coincidentally did a great write-up of amazing food in Tokyo. I was jealous. So for my revenge, I decided to go eat some nice food of my own. If only I had the budget to do this every night for a week or so. But I don't. 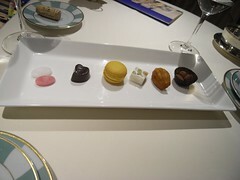 So, R. and I went out to Tateru Yoshino at the Shiba Park Hotel. It was probably my favorite of all the Christmas dinners that we've done for the past three years. For comparison, the other two were at the New York Grill, and the COUCAGNO in the Cerulean Tower. They were both very good, but I remember feeling like I would explode after both of those meals. This time, the portions were smaller or I've gotten fatter because I didn't feel like I would explode. We also drank less this time (only one glass of champagne and one bottle of wine) so I wasn't nearly as drunk as the other two times. 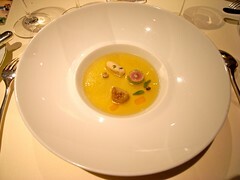 We had a wine tasting menu at COUCAGNO which was great, but too much to drink. Of the places that we have eaten, this one was at the lowest elevation, at only the first floor. The other two were forty or fifty floors up. The food was great though. The evening was full of truffes, but I have had so few of them that I can't really evaluate whether they were good or not. 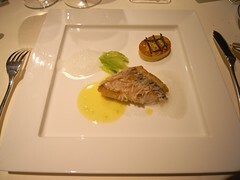 The stand-out dish to me was the fish (the Amadai, I don't know what it is in English or French.) 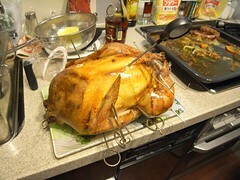 It had a great crispy shell and was just marvelously delicious. 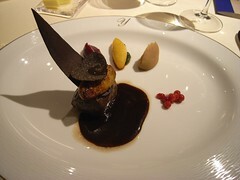 I also really liked the cabbage dish, and R.'s deer with chocolate. I would have preferred that to my bird, which was also quite nice, but I'm glad we tried a bit of each. 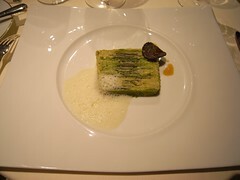 The cheese wasn't so great for me, since I am not a big cheese fan, but R. really enjoyed it. 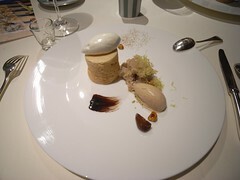 The dessert (the real one, with the ice cream and cake-like crunchy object) was also great. Overall it was a really nice dinner. We also split a nice bottle of white wine, which of course I have now forgotten. I'm not sure what we will do next year - I want to try to get reservations at the Molecular Bar but who knows? Flat Everett is a new friend of ours that arrived in the mail the other day. My cousin (non-flat Everett) had a school project where they make a flat version of themselves, and then mail them off to friends. 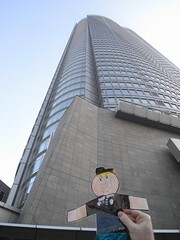 Then the friends will show the Flat Person around the town they live, and take a few pictures, that sort of thing. Sounds like fun! It is a good reason to spend a bit of time around the town where you live. One of the things that my wife and I sometimes do is have dinner at a nice sushi restaurant that her family has been going to for many years. They know the head chef there, and he's a really nice guy. 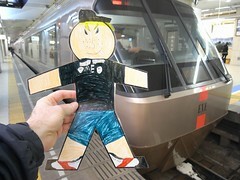 The sushi place is about an hour out of Tokyo, so we needed to catch a train. 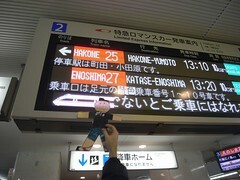 We headed out to Shinjuku station, which is one of the busiest train stations in the world. 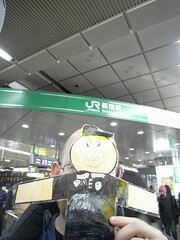 From Shinjuku station, we took the strangely named Romance Car out to Sagami Ono. We didn't have enough money to get a separate seat for Flat Everett so he rode (fairly comfortably I think) in the seat-pocket. 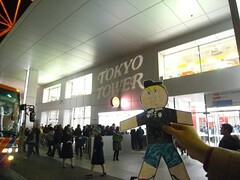 Once we arrived, Flat Everett met two Japanese women dressed up like Santa. It was just before the Christmas holiday and so there was lots of themed Christmas advertising and trees. People in Japan don't celebrate Christmas like people in America do. Christmas is not a national holiday and people go to school and work on Christmas day. Christmas Eve is a time for couples and couples will often go to a nice dinner and exchange presents. People don't usually give presents or toys to each other on Christmas though. They traditionally have Kentucky Fried Chicken (they do a lot of business on Christmas and Christmas Eve, due mostly to strong marketing campaigns in the 70s and 80s) and a Christmas Cake. I haven't had a Christmas Cake yet, but all the big department stores take pre-orders for Christmas Cakes a few weeks before Christmas. 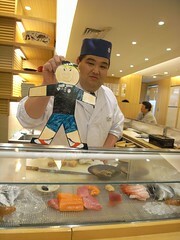 We walked to the Sushi place (a nice restaurant in the local department store) after doing some shopping, and Flat Everett met the Sushi Chef there. He also made friends with my niece. 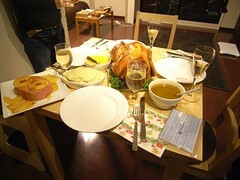 The dinner was great, and we all went home very full. Unlike Flat Everett, I am starting to turn round. I need to see what Flat Everett does to keep in shape. 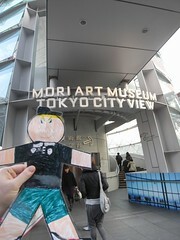 The day after Christmas my wife and I had the day off so we decided to go out to one of our favorite places in Tokyo (the 54 story Mori tower's Mori Art Museum) and Flat Everett came along with us. We've gone there a few times in the past year, at least three or four, and there is also a great view from the top of the tower over Tokyo itself. 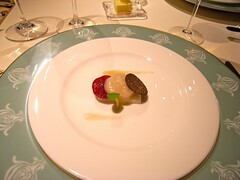 I had also, a few weeks prior, made reservations at the nearby Tateru Yoshino in the Shiba Park Hotel (a French restaurant that received a Michelin Star rating the past few years) in the evening, so we planned to make a day of it. 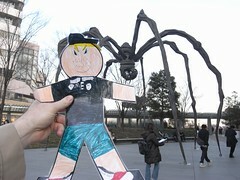 There is a big Spider sculpture outside of the Mori tower, and Flat Everett got a picture there too. The thing is large, and creepy. At night it is lit up a bit, and is intimidating. It also moves slightly with the wind, and has moved six or so inches in the four or five years since the tower opened. Walking past the spider, we eventually get to the entrance of the Mori Art Museum, and Flat Everett wanted a picture there also. Inside the museum there is a strict policy against taking pictures, so we don't have any pictures there. The exhibit we went to see was the Medicine and Art exhibit, which looked at the study of medicine as art. There were lots of drawings of human anatomy through history, including three drawings by Leonardo Da Vinci. It was a very interesting exhibit. 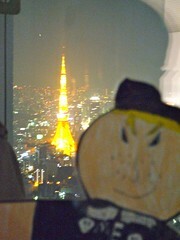 After the museum, Flat Everett, my wife, and I went up to the City View to get a look at Tokyo at night. 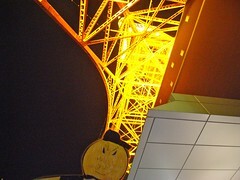 One of the most famous sights in Tokyo is Tokyo Tower, a tower built in 1958 modeled after the Eiffel tower. We got a picture or two of Everett in front of the tower from the City View area, and then headed out to dinner. 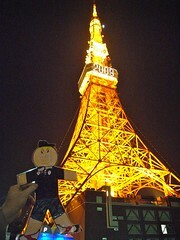 Our dinner was in Shiba park, and to walk there (about two miles) we would need to walk right by Tokyo Tower. So Flat Everett got to take a look at the tower up close. Since it was the day after Christmas, there was still a lot of Christmas decorations up. A lot of people come to Tokyo for Christmas with the girlfriend or boyfriend to just see all the Christmas lights and decorations. 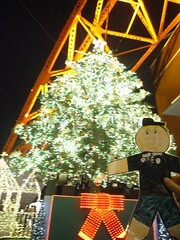 Tokyo Tower was no exception, with a big Christmas tree and lights and a little light show on the hour. 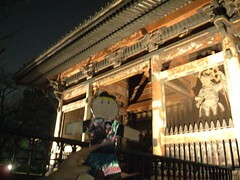 Right before we arrived at the hotel, there was an older Temple Gate with some statues in the gate. Flat Everett wanted a picture of that as well, although it didn't really turn out all that well. Flat Everett didn't join us for dinner, but it was really great. I think we might try to visit a temple before Flat Everett moves on and visits a friend of ours. 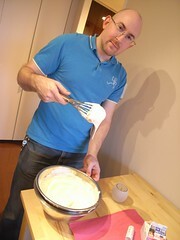 Holy crap, whipping cream is hard! I've been in Japan for a few years now, and I've really enjoyed Osechi Ryouri (the food Japanese people eat at the New Year) but this year, I really wanted to have a traditional American Christmas Dinner. In our family we usually had Turkey and ham at Christmas. 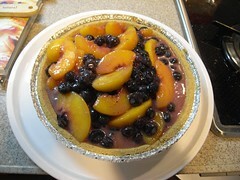 We also usually had corn, peas, sweet beets, mashed potatoes, buttermilk biscuits, and ambrosia fruit salad. I'm not sure why, but my family really loves ambrosia fruit salad. It is basically fruit coctail with marshmallows and miracle whip and way too much sugar. Turkey. But I'll cheat: R.'s grandma wants to make turkey for Christmas, so if I buy her one, she'll make the stuffing for mine too. Great! Gravy. Because, you know. Gravy. Honey glazed ham. Doesn't look like it is too tough, and I love honey and ham and sweet stuff and pineapples. I don't see how I can screw this up. Mashed potatoes. You can make those frozen ones easily and they taste great. Also, R. went to IKEA recently and brought back a bag of frozen mashed potatoes. Coincidence? I think not. Corn. I love corn. And it is also easy to make if you have a bag of frozen corn. Which I do. Because I bought it. For tonight. Cookies. I even made a bunch in advance. Chocolate chip (the best), sugar, and gingerbread men. Ambrosia Fruit Salad. Like I said, it is an "our family" kind of food. I did make it a bit less sweet though. 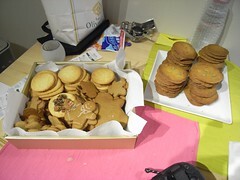 So I actually started working on the cookies a few days earlier. They turned out amazingly great, if a bit flat. I need to work on that. I love the chocolate chip cookies, but wish they were a bit thicker. I think I can fix that though. Somehow. More flower, or more sutff to leaven the flour. Or who care. They are great! Just jam two of those things together. After the pie I started in on the turkey. 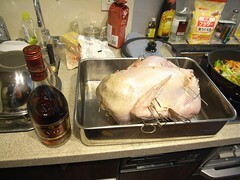 Add some water, baste in brandy (Suntory style.) Every 15 minutes. And made sure the water doesn't disappear. Not so bad. Two and a half hours of that. But, on the plus side, it turned out great. Also, after the turkey was done, R. made some gravy from the neck and giblets. After that was done and while the turkey was still cooking, I started on the glaze for the ham. Basically honey and butter with a bit of molasses (since I had some left over from the gingerbread man cookies and it seemed close enough to the dark corn syrup the recipe called for) heated in a double broiler. I didn't have one of those, so I went with the poor man's double broiler: one pot with water, one pot that is a bit smaller in that pot. Worked well. Enough. Man that sauce was strong. After baking the ham though, you really didn't get too much of the flavor, only a bit, and it was about right. The mashed potatoes worked out well, and the corn too. Those are pretty easy. Once the turkey was out, R. came home (oh yeah, I also vaccuumed and cleaned around the place) and started in on the gravy. I popped the ham into the oven and we let that go. Just about 3 minutes before that was ready, my friends called from the station and were lost, so I went and picked them up. And we had a great dinner. Our friends brought some wine (we went through a bottle of Champagne, and the red and white that our friends brought) which we polished off, and then had dinner. 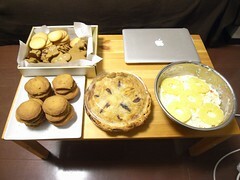 The pie reheated really well, and the cookies went over better than I expected. 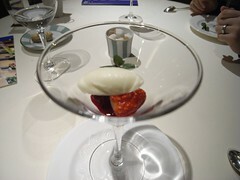 The ambrosia was, as expected, too sweet. And it was a lot less sweet than what we usually have. So the food went over well. Cleanup was a bit tougher. R. was passed out on the sofa, but that happens after drinking with a not unsurprising frequency so I didn't worry about that too much. Thankfully we sprung for the dishwasher (which are not very popular here or some reason) and after two loads pretty much I got through all the stuff. But our fridge is stuffed. And I am totally looking foward to the leftovers. I am really impressed that we pulled this off. We've had two other dinner parties (curry and nabe) but this was by far the most planned. And the one that I had to do the most work for. And I really enjoyed it. Guess this post just comes off as a bit "what I had for dinner plus lots of bragging" and well, that is what it is. But it was good dinner, and I was able to eat better than I expected. Up next on the ebook reader: Lawrence Watt-Evans "The Misenchanted Sword"
Lawrence Watt-Evans' Ethshar book series page. But cheaper at Fictionwise.com. Sadly. Come on Amazon, get some good low-price options going here! I love impulse buying books that can be digitally delivered! The book is available on Amazon, but over at Fictionwise.com they have a non-DRMed version of the ebook for a mind-blowing $2.80. Wow! That is an impulse buy! So I impulse bought it. Now I have to load the thing up on my ebook reader and start reading. I am currently reading some objective-c programming stuff on there, but some good fantasy is so much more attractive than dry pointers and object oriented stuff. Well, maybe. In either case, "here there be dragons", as the old unix long-beards say. I committed to cooking dinner for my wife and some friends this week. One of the things I want to do is have some traditional Christmas desserts. 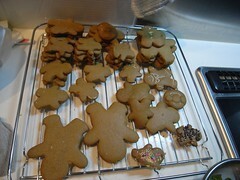 So I decided to try making some Gingerbread Cookies. I've never really been a huge fan, but they are usually around at our house for Christmas. And if I was going to cook those, I could use it as an excuse to bake some of my favorite cookies: Chocolate Chip Cookies. In the afternoon we went over to R.'s parents place since her sister and our niece is there for the holidays, and we thought it might be fun to make cookies there with her. At R.'s parent's place they do have a mixer. 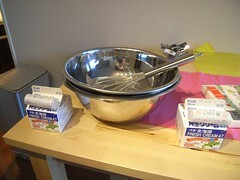 A drink mixer. 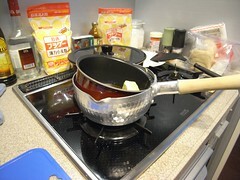 A kind of one-handed electric mixer motor. We actually have one at home too, but lost the mixing heads during the move. So I wasn't able to try it at home. Using it here, the thing definitely is not powerful enough to deal with cookie dough well. It got super hot and then bad smelling. I know enough about electronics to know that once things start to smell funny you stop using them. Or soon you will be forced to. So I finished a lot of the mixing by hand. I hadn't used molasses before. The stuff stinks. I'm amazed at the end at how good the things turned out. Threw some salt and pepper in there too. And lots of other spices (nutmeg, cinnamon, that kind of thing.) After making the dough for the gingerbread cookies, I washed stuff out and started in on the sugar cookie dough. 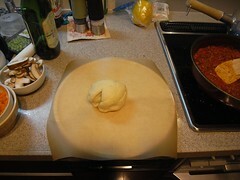 That dough was a lot simpler but took a lot more muscle because there just was not much in the way of liquids in there. One egg, and a teaspoon of vanilla extract. After running four batches or so through the over, R. and her sister started in on the gingerbread men. We eventually got that stuff working and put two batches through and then started to decorate a few. 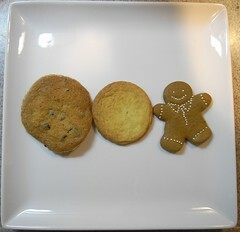 The cookies (sugar, gingerbread, chocolate chip) all turned out great, if a bit thin, and maybe a bit burnt on the edges. We've got a whole bunch of cookies for the Christmas (well, the 23rd, since that is the Emperor's birthday and is an actual day off) dinner. Now I've only got to manage to bake a pie (I'll cheat an use a pre-made crust and pie top) a turkey (I've done that before though, and am getting help on the stuffing) a glazed ham (but super small and I doubt I can mess that up) mashed potatoes (from IKEA! Seriously!) and some peas / corn / carrots. I think it will turn out great. And if not, I've got loads of cookies.